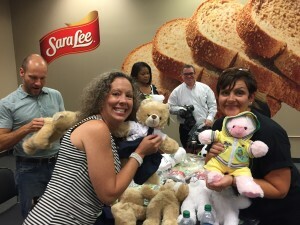 I recently traveled to Pelham, Alabama, just outside of Birmingham, to work with Bimbo Bakeries on a really fun Rescue Bear® team building event. Bimbo Bakeries US is part of Grupo Bimbo, the world’s largest baking company, and although many American’s are not familiar with their name, the brands that they represent are iconic. Sara Lee, Boboli, Ballpark Franks, and Mrs. Baird’s Bread are just a few of the well-known brands that make up their large assortment of bakery items that are found in stores across the USA. The Rescue Bear® team building event was for a group of their sales, manufacturing, and distribution managers from their Southeast region. With bakeries in Atlanta and Meridian, Mississippi, the Pelham sales center is centrally located as a great distribution point for the area. 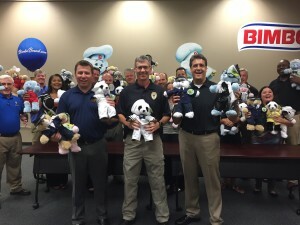 The typical Rescue Bear® event is designed for a two-hour time frame, but Bimbo’s HR team decided to have us customize the delivery to add in more team building principles and learning, so during the standard exercises, I was able to add more teaching and team development along the way. We focused a lot on personality temperaments. Although a lot f team building companies teach DISC profiles and Meyers-Briggs assessment workshops, I find many of those types of activities to be overly complicated and — dare I say — boring. So, instead, helped the entire group quickly self-organize into groups that had particular strengths and skill sets, which, very accurately, organized the group by personality temperament. Once in their groups, we had each new team accomplish tasks geared toward the natural strengths of each group. Once all of the fun activities were completed, they had every item they needed to begin building the stuffed animals, but of course, they had to share resources with the other groups to accomplish the final task. We were able to show the group how every team had their strengths, but when all of the strengths come together, the esprit de corps of the entire company is elevated. The event was a blast, and everyone had a lot of fun. At the conclusion, Patrol Sgt Roberts of the Pelham Police Department dropped by to accept the stuffed animals on behalf of his police officers. His officers will keep the toys in their patrol cars for instances where children or their parents have been injured, and a comfort item like a soft toy is welcomed.